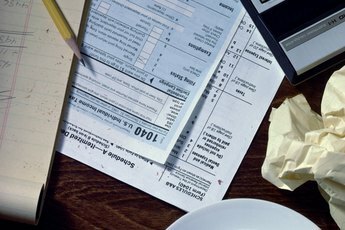 Taxes can take a major bite out of your paychecks, but is possible to pay less in taxes by taking advantage of tax write-offs. Write-offs are certain expenses that the Internal Revenue Service lets you subtract from your total income when calculating your income taxes. Tax write offs can potentially save hundreds or even thousands of dollars a year in income taxes. The term "tax write-off" means the same thing as "tax deduction." The government offers tax deductions to reduce the burden of taxation on certain people or to encourage certain types of activities. For example, the government offers a variety of tax deductions for business expenses, which makes it easier for new businesses to achieve profitability and create economic growth. It is important to document deductible expenses, not only so that you remember to claim them on your return, but so you can provide proof of the expenses if you're ever audited. The IRS offers three basic types of tax deductions: standard deductions, itemized deductions and above-the-line deductions. 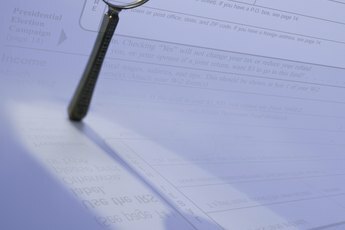 When you file a tax return, you have the option of taking a standard deduction -- an amount that is granted to all taxpayers of your filing status -- or the sum of your itemized deductions. You can't take both: you have to choose between standard or itemized. For example, in 2012 the standard deduction is $11,900 for married couples filing a joint return in 2012 and $5,950 for singles and married people filing separate returns. Itemized deductions include various qualifying expenses you incurred throughout the year. If the sum of these expenses is greater than the standard deduction, you'll save money by itemizing. Above-the-line deductions are special tax write-offs that you can take in addition to your standard deduction or itemized deductions, such as the tuition and fees deduction. Common write-offs that taxpayers can include in their itemized deductions include real estate taxes, home mortgage interest, the cost of operating a home office and business travel expenses. Donations of cash or property made to certain organizations like religious institutions and other charitable nonprofits also count as itemized deductions. Common above-the-line deductions include contributions to IRAs, alimony, up to $2,500 in student loan interest and half of self-employment taxes. Tax write-offs differ significantly from tax credits in the way they reduce the amount of tax you owe. A tax credit directly reduces your tax liability, so a $500 credit saves you $500 in taxes. A tax deduction reduces your pool of taxable income, so the amount of money a deduction saves depends on your income tax rate. For example, if you are in the 25 percent tax bracket and you take a $500 tax deduction, the write-off saves you 25 percent of $500, or $125. How Much of My Classroom Expenses Can I Write Off as a Teacher? What Is the Definition of Adjusted Taxable Income? 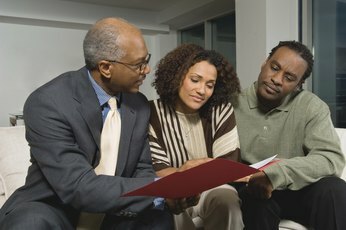 Does Buying a Home Always Help My Tax Return?